With stunning views across the Pacific Ocean from the Palos Verdes Peninsula, the Trump National Golf Club is located just outside of Downtown Los Angeles along Trump National Drive. Although designed with golfers in mind, the club has been lavishly decorated with crystal chandeliers and classic grand fireplaces to create a suitably glamorous space for couples to host luxury wedding events. A long, winding driveway provides a dramatic entrance to the Trump National Golf Club, set atop a bluff and fronted by an immense classical fountain. From the moment your guests arrive they will be left awestruck by the opulence and grandeur of the venue, exuding the excess luxury for which the billionaire businessman is known. 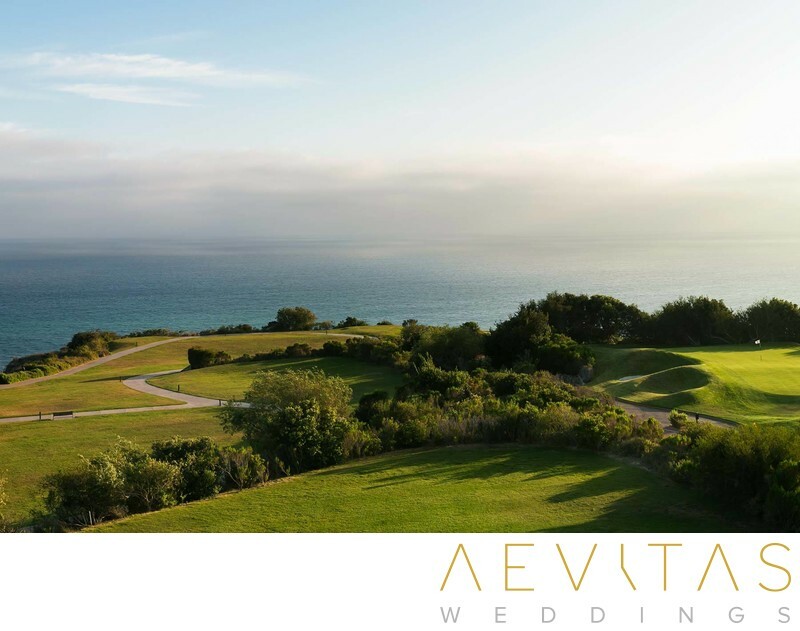 Wedding ceremonies at the Trump National Golf Club are held on its Vista Terrace, which looks out across Rancho Palos Verdes Beach and provides an undeniably romantic setting during the late afternoon “golden hour” of light. These expansive lawns are backed by the fairways of the golf course itself, whilst retaining a secluded ambiance and offering the flexibility to personalize with your own decor. Afterwards you can wander along the emerald “greens” for a whimsical sunset couple portrait session, or head down to the sandy beach to capture the last rays of the day’s light. Receptions can be held either within the spacious Grand Ballroom for wedding parties of up to 300 guests or upstairs in Trump’s Room for more intimate celebrations. The Grand Ballroom features six Waterford crystal chandeliers, a grand limestone fireplace and French doors that open out onto a glass-enclosed balcony overlooking the ocean, while Trump’s Room is draped in prestige, with ornate carved moldings overlain in 24-carat gold and a sky-blue ceiling fresco encircling an opulent glass chandelier. The Trump National Golf Club has received acclaim for its modern American cuisine and menus can be customized to the couple’s individual desires. The service here is second-to-none and in keeping with the luxury of the venue, ensuring your wedding guests will be attended to with the distinction that a Trump National Golf Club commands.